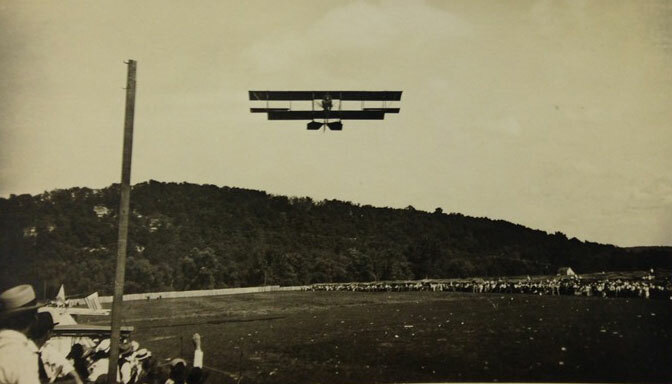 Barnstormer Ruth Lauer over the 1917 Fairgrounds. Photo courtesy of Vesterheim Museum. 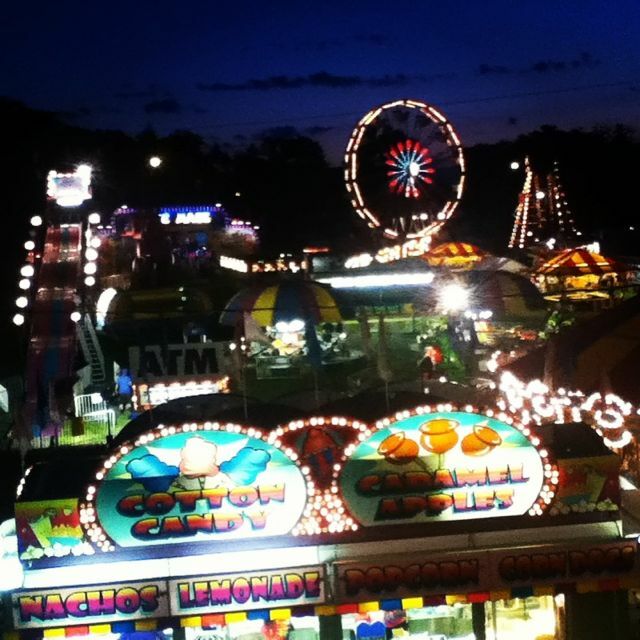 The first county Fair celebration held in Winneshiek County was in the town of Hesper in the fall of 1873. After a few years the celebration was moved to the town of Decorah. In April of 1918, a corporation, the Winneshiek County Agricultural Association, was formed to oversee property set aside for the annual Winneshiek County Fair. The purpose of this corporation was “to further the interest of animal husbandry, agriculture, horticulture, and floriculture; to improve and encourage the breeding of fine stock and poultry; to stimulate the study of arts and sciences; to hold and give Fairs and other exhibitions where the products of the same may be exhibited.” The nine-member elected board eventually became known as the Fair Board. 1924—Three days of constant rain cancelled the Fair and left the Fair thousands of dollars in debt—nearly bankrupt. The Association was down, but not defeated. 1927—Bonds worth $12,000 were issued, paying 6% (going rate was 4%) to erect a new grandstand. The new “curved” grandstand was ready to use for the 1927 Fair. It took until 1943 to pay off the last of the debt and get the title. Today the grandstand is still in use and one of only a few grandstands with its unique curved architecture still standing. 1930—With crowds dwindling over the past years, the Fair board was looking for something to bring them back. Fair boards have always been innovative and known to do some unusual things—this was one of those times. In the summer of 1930, the board advertised for a couple that would be willing to get married at the Fair. The week before the Fair started an announcement went out in the newspaper: “A wedding will be held on Friday, September 25 at 8:30pm and YOU ARE INVITED!! 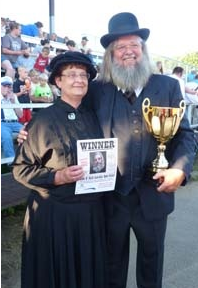 The lucky couple was announced at the start of the Fair. The couple had only been promised $50 from the Fair board and their license, but the merchants didn’t want to be left out. Over 65 merchants donated gifts, plus the groom’s suit, bride’s dress, flowers and even the rings. The preacher, the wedding singer and band donated their time. It worked!! Over 7,000 people paid the $.50 gate to overflow the grandstand and spill out on the track and around the stage. After the ceremony fifty $1 bills were brought to the stage. Then the bride was presented with a new rolling pin with the order to "Use it!" The Fair of 1931 was entertained with a double wedding. 1938—The first new livestock barn was built to accommodate the growing number of livestock. The barn was a 58' x 150' structure and allowed more livestock to stay at the Fair. 1939—The need for a community gathering place was growing and the Fair stepped up again to help. A 40' x 120' building was built to be used during the Fair and year-round for several social gatherings. 1946—Always looking for ways to promote the Fair, the summer of 1946 found a billboard along the highway promoting the Winneshiek County Fair as "The Biggest Little Fair in Iowa!" The sign did bring in a lot of curious people who were not disappointed. The slogan has stayed with the Fair and is still in use today. The name is bit of a misnomer because in actual land size the Fairgrounds at less than 9.5 acres is the second smallest Fairgrounds in the state. 1954—4-H enrollment was growing in leaps and bounds. The livestock numbers were outgrowing the facilities. A new 64' x 178' livestock building was built. Because of this new structure the FFA livestock were allowed to stay on the grounds for the first time. 1979—The only show ring the dairy and beef had known was under the clear, blue (sometimes rainy) sky. It was time for a show barn. The board organized a fund drive to raise funds to build a show barn. With the help of over sixty individuals and groups canvassing the county for donations and pledges, they succeeded in raising over $30,000 in a matter of three months. The show barn was used for the first time during the 1979 Fair with the names of over 690 contributors lining the walls. 1990—Looking for ways to increase attendance to the Fair, the board decided for the first time in the history of the Fair to eliminate the gate fee and make entrance into the Fair FREE. The only charge would be for the grandstand shows. The crowds doubled the first year and kept increasing, as people found out about the open gate. People would come down to eat lunch and go back to work and come back each evening to meet with friends. The Fairground has always had a racetrack and from the horse races of the early years to the stock car races today, races are still a part of the Fair and Fairgrounds. In the 1960's, the half-mile track saw weekly races through the summer. The 1970's saw the decline of dirt track racing and by the end of the decade it was phased out. After the gas crisis, the surge of interest in racing and NASCAR put local racing back on the track. In 1989 with a shortened quarter mile track, weekly racing was back and is still going strong today. Today the Fairgrounds are still managed by a nine-member elected board of the Winneshiek County Agricultural Association along with 25 Auxiliary members. We have been blessed with great 4-H and FFA leadership in our county and the number of livestock has expanded beyond the capacity of our buildings. 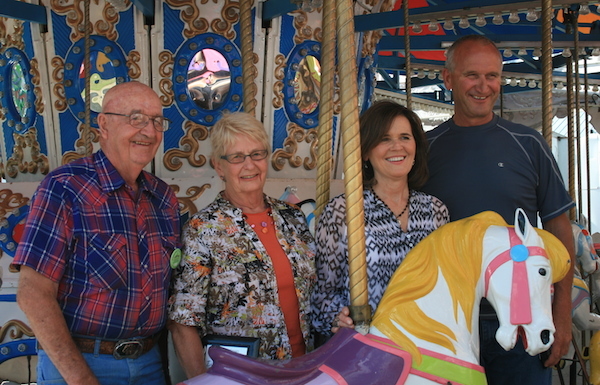 The Winneshiek County Fair has come a long way from lanterns to light bulbs and outhouses to indoor plumbing, but the people and their spirit will always make the county Fair a great family and community event.